My friend Maranda is a very talented seamstress. She is the owner of Maranda Lee Handbags. Her creations are great purses, baby bags, gym bags, you name it bags! Check out her website or her Etsy shop for her other great items! -Includes 6 pockets (1 cell phone pocket, 2 regular pockets, 3 elastic pockets perfect for water bottles, baby bottles, sippy cups, snacks, checkbook, diaper/wipes). -Bag measures 17” w, 14” h, 4” d, strap adjusts from 21" up to 42"
To enter this giveaway, post a comment with (1) your email address AND (2) your favorite color (both are a must to enter). It's that easy! Winner will be chosen at random an announced on Saturday, October 27. That bag is super cute! my email is mellyb10@yahoo.com and my favorite color is purple. cute bag, my favorite color is purple. Super cute bag!!! I LOVE the Camel Polka Dot color! love it! I really like the Gray Damask color! My favorite colors are blue and brown. Such a cute bag! Not only is your blog filled with great tips and recipes, it makes me miss home-originally from Whitefish and currently stuck in southern Indiana-my email is ka.legate@gmail.com and my absolute favorite color is plum purple! LOVE this bag! 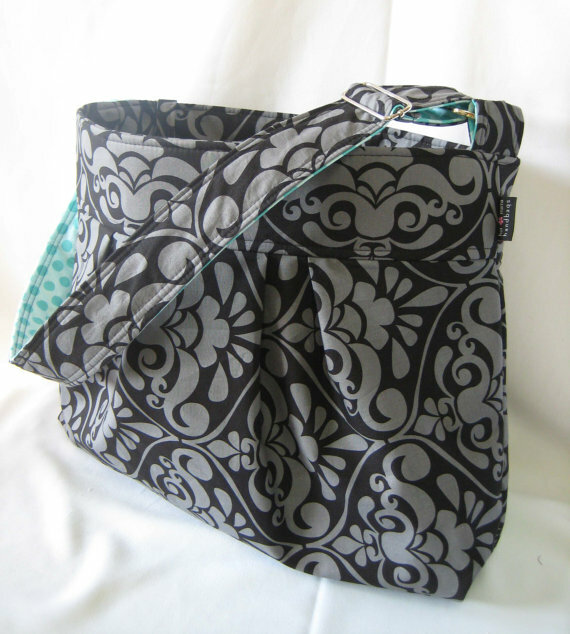 It would be the perfect diaper bag for my new baby :) My email is Liz21078@aol.com and my favorite color is green! That is such a cute purse! My email is Kimberli.Murrell@gmail.com and my favorite color is turquoise. I love your blog! My email is amy(dot)quinn70(at)yahoo(dot)com and my favorite color is blazing fiery red!! I LOVE the grey damask and turquoisey sea dot though....what a lovely bag! Thanks for the chance to win :) I love your blog and have been trying out one or two of your recipes every week! What a cute bag! My email is karifaust@yahoo.com and my favorite colors are grey and green. Just what I've been looking for! My favorite is purple and my email is paint59719@bresnan.net. abbydumont@gmail.com - I love teal and coral! I would ay my favorite color right now is purple or gray. My favorite color changes far too often, but I always come back to shades of purple! I love it! My favorite colors are purple and pink! Favorite color is Kelly green. Super cute! My email is whitney@hausers.us and my fav color is green. My favorite color is yellow! Cute Bag! My favorite color is blue! My favorite color is dark purple and my email is eaglecheer416(at)hotmail(dot)com. Super cute! I love blue and gray. My email address is jenniferjeffress (at) hotmail (dot) com. Thanks! This bag would be perfect for all my books! My favorite color is blue and my email address is natalieabq@yahoo.com. abbydumont@gmail.com - I love teal and corral! mad.gen@gmail.com - and my favorite color is purple (sublime when paired with a rich green). I love the yellow zig zag bag. I'm pretty sure I'm going to make some throw pillows in that fabric like tomorrow! mybranehurtz at gmail. Great bags and super fabrics! my email is cwmarchant@msn.com and my favorite color is turquoise! Love this bag!!!! My email address is missyquiggsyahoo.com and my favorite color is turquoise. That bag is adorable! I love green AND purple! My favorite color is blue and my email is phillippa.chadd@gmail.com! Cute bag! I love the colors shown! Black & teal are my favorites. My email is princess37174@gmail.com and my favorite color is orange! My email address is heidiallison@gmail.com and my favorite color is turquoise! Beautiful bag!!! I love the Damask! My email is tansytree@yahoo.ca and I LOVE avocado green! Wow, your friend is talented! Love what she's doing. My favorite color is purple! My favorite color is turquoise/aqua blue. Cute bag! My email is aclatterbaugh@gmail.com and my favorite color is purple. Love this bag...so cute! Favorite color is green! I'd say my favorite color would be any shade of blue. It's a perfect color for all seasons! The bag has great styling. Wow! It would be great to win it. My favorite colors are dark jewel tones such as blues, purples, greens, and reds. So cute! My favorite color is yellow. jennicodington@hotmail.com! My favourite colours are lavender (purple) and turquoise! Adorable bag:) csporto2004@yahoo.com and my favorite color is purple. Great giveaway! I love purple and my email is hhodges@tnstate.edu. I like most shades of green. Yellow is my favorite color! I love the bag! Wonderful bag! My favorite color is earthy green. My Favorite color is Evergreen or pinegreen. Love the bag! My email is hyun_kate@yahoo.com and my favorite color right now is coral. Very cute! becky.haroldson@hotmail.com my favorite color is purple. Thanks!